This may be the heaviest set of stories I have ever posted - and over the years I have posted some heavy ones. 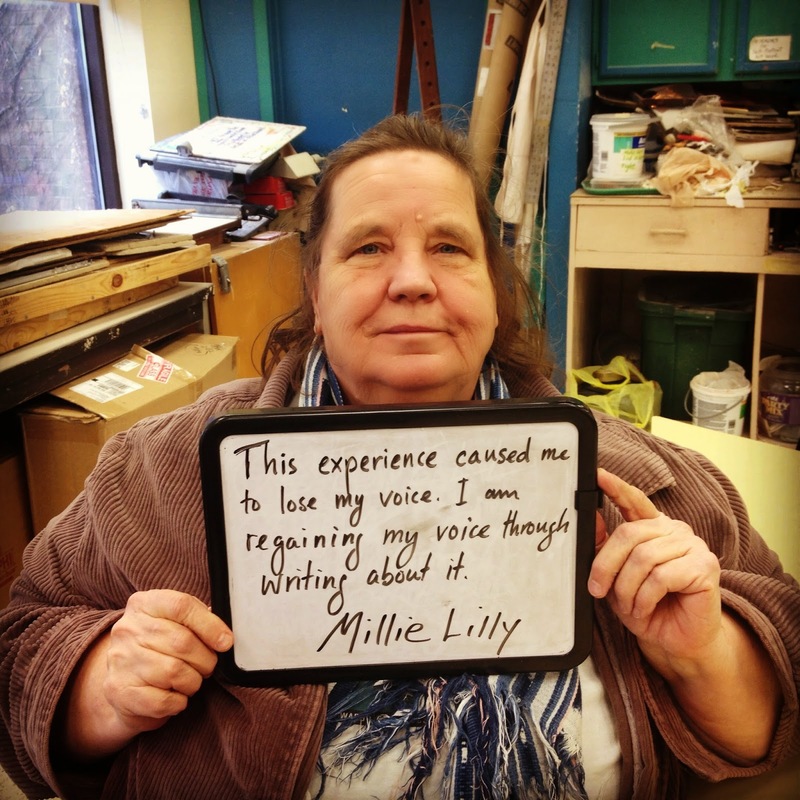 After every session for several weeks now, Millie and I stayed after class to chat about what she had written. Every week, I could see a greater strength and happiness in her eyes. The Thursday before last, she said something spontaneously which stuck with me (and will probably always stick with me), and this Thursday she wrote it down for me and let me take a picture, so we can both remember it, word for word, spoken in her voice. After showing Millie this picture on my phone, we looked at each other and I cried tears of joy. The weight lifted by this picture is heavier than mountains. If there is anything you would like me to pass onto Millie, please post it as a Facebook comment or send me a personal email at benita@bestdayofmylifesofar.org. If you are going through any struggles, past or present, of your own, I hope that Millie’s stories offer you the motivation you have been waiting for, to confront your struggles in some way. I had no memory of what happened to me in Newfoundland until my early forties. I was almost 16 when we left Alaska for Grand Forks, North Dakota. I was a junior in high school and was sad about leaving friends and a place I felt I belonged. North Dakota was cold, with the extra added feature of wind that cut through you like a knife. Only small trees and soil that was dry and dusty. Potato land. I remember standing in the living room listening to my mother crying and reading a letter that had taken a long time to catch up to us. It was from Harold’s wife, saying that he had died after an illness, and he had suffered much. I had no memory of the horrible things he had done to me. Still, I thought: Good. Good. Good.